October is International Dinosaur Month. It doesn't seem to get the attention I would think it would, but it's a good reason to make a book about dinosaurs. 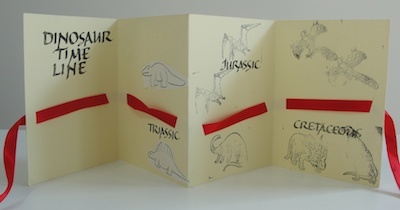 The first book I ever made with a group of children is pictured below—a Dinosaur Time Line with my son's Montessori preschool class twenty-two years ago. I had run the paper through a copier so the writing was already there and made slits in the paper (cover stock actually) ahead of time. The kids threaded the ribbon through the slits and using stamps and pictures, put the dinosaurs in the proper time period. The current project reflects the changes I have made to my teaching over the years. 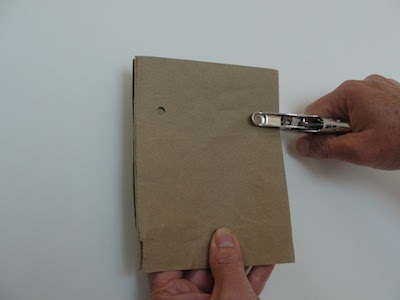 I used one panel of a grocery bag cut in half the long way (recycled materials) and a hole punch for holes instead of an exacto knife for slits (the simplest tools and materials). Making this book brought me back to my son's preschool days when these complicated Latin dinosaur names rolled off our tongues. 2. 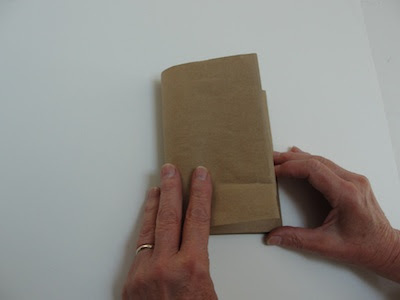 Take the side edge of the top layer, fold it back to meet fold, and crease. 3. 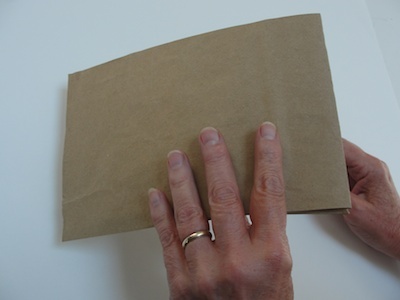 Turn the paper over so the big side is on top. 4. Take the side edge, fold it back to meet fold, and crease. 5. 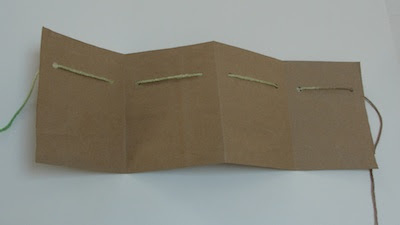 Punch a hole through all the layers on either side of the folded accordion towards the top. 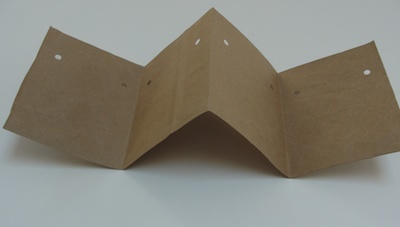 When I do this with young chuildren, I quickly go around and punch the holes. If the group is large, it's good to have some extra adults or older children to help. 6. Open the accordion and stand the book up so that if you look at it from side you see the letter "W."
7. 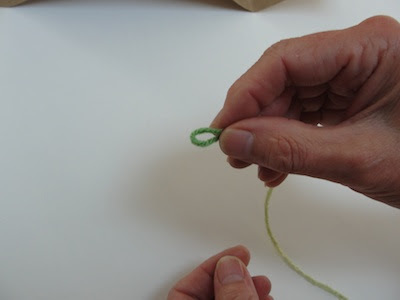 To prevent the yarn from fraying, fold the edge over to make a small loop before threading it through the holes. 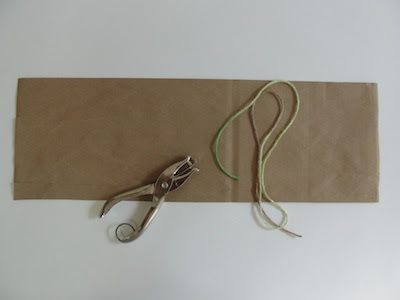 With younger children, you may find it helpful to wrap one end of the yarn with tape or dip it in white glue ahead of time so they don't have to do this step. 8. 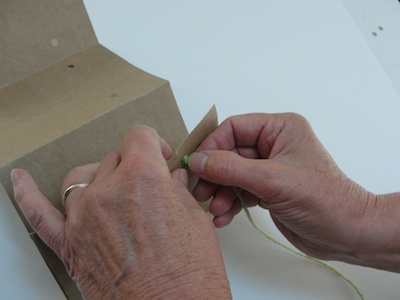 Starting on the outside of the W (either side is fine), push the yarn through the top hole. 9. 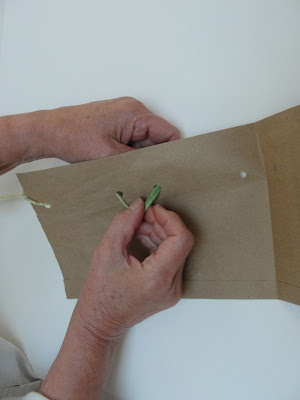 Pull the yarn and insert the end into the next hole on the same page. 10. 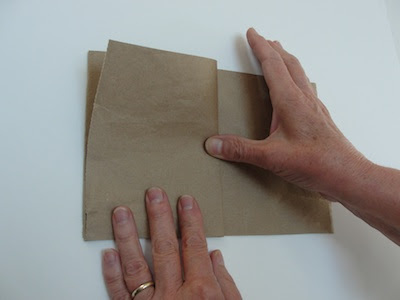 Turn the paper over, go over the mountain fold, and insert the end of the yarn into the next hole. 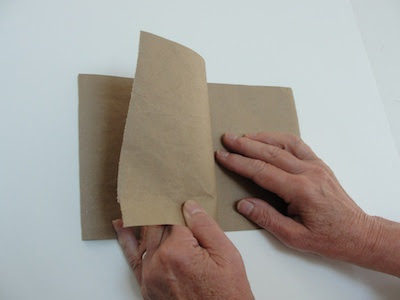 Turn the paper over again. 11. Continue until the yarn is threaded through all the holes. 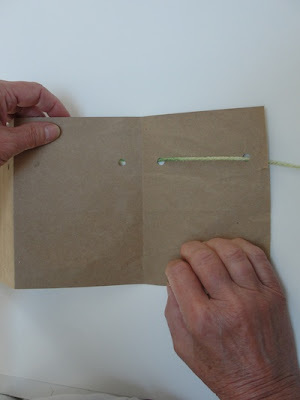 Adjust the yarn so that there is an even amount on each side of the book. 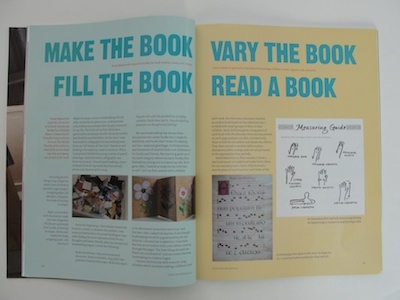 A copy of the most recent Letter Arts Review which contains my article about teaching bookmaking to children. Here's the blog post I wrote about it. Leave a comment and enter into a random drawing which closes midnight on Wednesday, October 5. I teach middle school science and we used your word a day books to make vocabualry boxes. I love using recycled materials. I am surrounded by books ... they are my insulation from the world. Not a better investment to be made...the book is always waiting to be opened, to share itself again and always in a new way. Congratulations to you on your article and how delighted I am to learn this is the month of the Dinosaur ... ! You continue to amaze me with your outreach online and your exhibits. congrats on your article. I love this magazine. I love your dinosaur book and I know my great nephews are fascinated with them - so a project for next time I babysit them - thank you! We will be doing this project this week as part of our dinosaur study. Thank you so much for the great idea. My children are going to love this! I look forward to your images and posts thanks to much. My son's school would enjoy making books - your article would help us prepare. I've just found your blog and love it!! 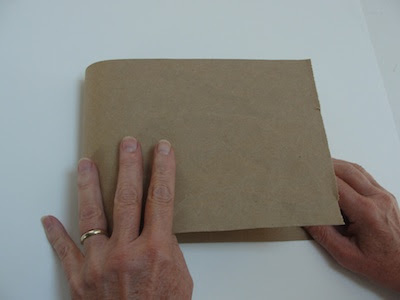 I've been teaching kids to make books on and off for years. Now making it more of a focus. Thanks for giveaway!